BelAir Gear Replaces Tropos Routers in Addison, Tex. The Bluetooth SIG will create a version that runs over Wi-Fi: Bluetooth comprises applications and radio standards. The applications include standard profiles that developers use to add features like keyboard and input device access, file transfer, and dial-up networking. The Bluetooth SIG has a long-range plan to keep Bluetooth relevant by essentially adding more radio technologies underneath, not just the 1 Mbps version found in Bluetooth 1.x and the 3 Mbps version in the Enhanced Data Rate (EDR) part of 2.x+EDR. Ultrawideband (UWB) was one of the preferred newer radio standards, something they decided on supporting in March 2006, because UWB seemed to be near term at that point, and was part of the original migration path for personal area networking in the IEEE 802.16 group that Bluetooth has some coordination with. (UWB was to be the radio standard for 802.16.3a until the group disbanded over friction caused by a now-dropped original flavor of UWB from what is now Motorola spin-off Freescale.) UWB is low-power and low-range, making it ideal. But it's hardly on the market yet and is way too expensive. This pushes back Bluetooth over UWB in handsets to something like 2009. TechWorld notes that UWB vendors say that UWB handsets will be on the market (in Asia) within six months. Of course, UWB chipmakers and manufacturers have been telling me since 2006 that UWB products will be shipping in a few months. They weren't lying; complications ensued. I accept that. But I'm now Missouri as regards UWB in shipping hardware. As a result, TechWorld reports, the SIG's chair, ironically a Motorola employee, said that they would focus on building Bluetooth over Wi-Fi. Details aren't available, and one UWB vendor says that Wi-Fi and Bluetooth are incompatible due to security models. Buffalo Technology was enjoined starting Oct. 1 from selling 802.11a and g gear in the U.S.: The Australian technology research agency CSIRO has a broad patent in the U.S. that's being widely fought. A Texas court, in a jurisdiction which patentholders attempt to get their cases remanded to, found Buffalo infringed CSIRO's rights. Buffalo has appealed. Buffalo's posting on their wireless products page notes, "Recently, Microsoft, 3COM Corporation, SMC Networks, Accton Technology Corporation, Intel, Atheros Communications, Belkin International, Dell, Hewlett-Packard, Nortel Networks, Nvidia Corporation, Oracle Corporation, SAP AG, Yahoo, Nokia, and the Consumer Electronics Association filed briefs in support of Buffalo's position that injunctive relief is inappropriate in this case." Buffalo can sell existing inventories and has permission to replace products under warranty. Although Buffalo mentions 802.11a and g, Draft N products are apparently under the import ban, too, perhaps because they incorporate 802.11a and g.
The Register notes that the Microsoft-led group that includes 3Com, SMC Networks, and Accton are pushing the eBay v MercExchange argument, which prevents injunctions in most cases in which a patentholder isn't actively involved in making a product that uses the patent. CSIRO's actions don't threaten 802.11n so much as impose a fee on it. If CSIRO can prevail, then every piece of 802.11a, g, and n (but not b) gear would have a small licensing fee attached to it. This would increase the cost of products by a tiny amount. Companies would also potentially either be liable (if they lost a lawsuit) or able (if they negotiated) to pay back fees in that case, too. After more than a year of providing hints at their capability, Eye-Fi has released their flagship product: a 2 GB Secure Digital flash card with built-in Wi-Fi for $100: The Eye-Fi Card connects over a Wi-Fi network using its own onboard processor to transfer images from the card to a computer or upload the photos to Eye-Fi's servers for further distribution. The camera has to be powered on within range of a Wi-Fi network; there's no other intervention needed. The company has partnered with 17 major photo-sharing, photo-finishing, and social-networking services and sites to enable direct transfer to one or more of those services when pictures are uploaded, based on your choices. 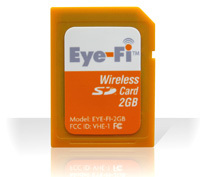 The Eye-Fi is not a generic Wi-Fi adapter: that is, it doesn't magically add Wi-Fi capabilities to a digital camera. Rather, it's a separate computer that happens to live within an SD card and can access the same stored data that the digital camera can. I expect to review the unit in the next week or two. In an interview with Jef Holove, Eye-Fi's chief executive, he explained that Eye-Fi had honed in on a very simple offering, with the potential to become more complicated later as the market dictated. He describes Eye-Fi as "a wireless memory card that lets you upload your photos," a concise summary. The Eye-Fi's intent is to allow zero-effort uploading of photographs taken on a digital camera. I haven't seen anything close to this amount of simplicity, including in the consumer cameras that have Wi-Fi built-in from Nikon, Canon, and Kodak. Those cameras generally don't allow full-resolution Internet transfers of photos, and lock you into specific upload services, such as Kodak Gallery (renamed for the third time in a handful of years). Eye-Fi wanted to provide full-resolution uploads, no preferred service, and eliminate the effort in initiating or managing the transfer. An Eye-Fi needs to be set up before it's used in a camera. The device comes with a small USB dock, and software for Windows and Mac OS X that can configure internal settings in the card. The software mostly exists to connect you with Eye-Fi's Web site, where you create an account, enter Wi-Fi network settings (including passwords), and enter or sign up for any of the 17 services you may use or belong to. Various settings are then installed on the Eye-Fi and it's ready to go. Whenever you're within range of any of the networks you've configured, the Eye-Fi transfers any pictures you've taken since the last transfer. The camera isn't involved. Holove said that there are three modes that the card can work in for transfers: transfer to the host computer; transfer to Eye-Fi's servers directly; or transfer to Eye-Fi's servers and then download to the host computer. The last option sounds a little confusing: why download photos again rather than transfer them over the local network? Holove explained that it would double the battery usage to transfer the images twice, so they opted to retrieve the images after upload rather than reduce the camera's charge. Holove said that they estimate the card consumes about 5 to 10 percent more battery than a camera would use otherwise; they found their beta testers hardly noticed the power consumption due to the increased capacity of modern batteries and more energy-efficient camera designs. The Wi-Fi component, an Atheros AR6001, uses very little energy while idle. There's no option to downsample photos on upload to reduce the upload time, however. Holove said that in this first iteration, they wanted to appeal to what they found was a common sentiment among photographers they're aiming at: the desire to upload full-resolution images. Holove said "As storage for these [photo-sharing] companies becomes cheaper and cheaper and cheaper, it becomes more affordable for these companies to store higher res images." The Eye-Fi is shipping initially as a 2 GB SD card because higher capacities require the use of SDHC (SD High Capacity), which isn't supported on many older and less expensive cameras. SDHC is required for 4 GB and higher memory cards, and Holove said that the firm "wanted to launch a product that would work with all the SD cameras out there." Initial partners are dotPhoto, Facebook, Flickr, Fotki, Kodak Gallery, Phanfare, Photobucket, Picasa Web Albums, Sharpcast and Gallery, Shutterfly, SmugMug, Snapfish, TypePad, VOX, Wal-Mart, and Webshots. Upping the ante for mobile devices, Atheros offers a series of chips that consume almost no standby power: In recent years, every new chip design for mobile devices focuses on three factors: integration, or the number of features backed into one chip to reduce the cost, form factor, and power use of multiple chips; size; and standby/idle power. That last can be the killer. You can have tiny chips, but if they pull several percentage points of the in-use power to maintain status on a network or scan for networks, it's hard to get out of the gate. With less power consumed, the longer lived a mobile device is, and the more likely a manufacturer is to design high-bandwidth uses. Atheros's AR6002 series (single-band g, dual-band a/g) consumers what the company calls "near-zero standby power," and 70 percent less than competing offerings in active mode. Their two examples are that the chip could be used on a standard phone to provide 100 hours of VoIP or download 200 GB of data. Chips will ship in quantity in the first quarter of 2008. BelAir wasn't gauche enough to mention this fact, but you just need to look at old announcements: BelAir put out a press release today noting that service provider RedMoon had opted to replace their network with BelAir's equipment--170 nodes that will be deployed over four square miles by the end of this year. Addison features a number of company headquarters, including, the release notes, "Pizza Hut, Mary Kay Cosmetics, CompUSA, and Palm Harbor Homes." Just over two years ago, RedMoon put in 80 Tropos nodes. RedMoon isn't big on announcements; their Web site's Newsroom page announces "text to come"; the Web site copyright date is 2006. No other deployments are noted. The firm was purchased by NewMarket Technology, a shareholder, earlier this year. NewMarket is "on track" to establish "$10 Million [sic] in profitable annual revenue from its broadband subsidiary...", a June press release notes. This release also lists three projects in Texas: Addison, Temple, and a Chevron project in Burleson. AT&T backs off from St. Louis, Mo., Wi-Fi network, but let's not be too hard on them: The network hit a snag that cropped up after an 18-month negotiation between the city and the company: the 51,000 street lights that were the first candidates for mounting Wi-Fi receivers receive no power during the day, and are bank-switched, meaning that power is centrally switch on and off for large numbers of poles at once. Utility poles were looked at, but in St. Louis, these are located primarily in the wrong places, such as alleys. Other locations proved to be equally problematic, as well as using batteries. Street lamps could be rewired, but it would cost an estimated $28m. I'm a bit surprised that there wasn't a survey of poles and lights as part of the process before AT&T bid, but the bidding process has varied city by city. In some cases, exhaustive inventories of city and utility facilities were assembled and enumerated; in others, that was all secondary to securing a basic deal. AT&T will build out a square mile of service downtown for now. T-Mobile says that it will offer free use of its hotspots across parts of Southern California: The company has made this rather classy offer in the past, too, during other disasters. Service is free across six counties: Los Angeles, San Diego, Orange, San Bernardino, Ventura, and Santa Barbara. This includes airports, Starbucks, FedEx Kinko's, Borders, Hyatt Hotels, and Red Roof Inns, among other locations. Service will be free through Oct. 31 and encompasses 1,200 locations. The press release notes, "The service is intended for those who have been displaced from their homes or are seeking refuge from the wildfires." Clearly, there's no enforcement of this, and I imagine there will be a big uptake from displaced workers, too, whether evacuated from their homes or not. There will be millions of people who have lost part or all their livelihood through this disaster. AT&T kicks in 600 locations, too. Gizmodo points out that the "wireless" element of Iogear's Wireless USB hub and dongle doesn't wash: The wireless part is the missing USB or network cable, but you still have to use cables to connect your USB devices to the hub, which itself requires AC power. Gizmodo found problems in setting up the Iogear system, which runs $200, and thought performance was poor. Separate drivers were required for the dongle and the hub. These criticisms are all pretty justified. Ultrawideband (UWB) networking in the form of Wireless USB can't shine until UWB radios and drivers are installed at the factory on laptops and peripherals. UWB chip costs are already dropping, and it's likely that $500-and-higher electronics, like cameras and camcorders, will sport UWB by next year, as will computers. When you can associate a UWB device directly with your computer, no hub required, its utility will be much higher. From this week's MuniWireless conference in Santa Clara, Calif., three bits of news: The AP reports on the latest State of the Market Report from MuniWireless, which dropped the estimate for US spending on metro-scale wireless networks to $329m in 2007 from $460m in the 2006 report. It's still a hefty 35 percent rise above 2006 levels, and MuniWireless's Esme Vos noted elsewhere that the survey was done in the height of the muni-Fi crash in August. Also from the conference, News.com blogs on AT&T's talk about their involvement with muni-Fi: Marguerite Reardon interviews AT&T's, take a breath, senior executive vice president of legislative and external affairs, let it out now, who says, "Cities have also evolved in how they think about citywide Wi-Fi. It's a very different scenario when a city is looking to partner with the private sector than if they go out and use taxpayer money and issue bonds to build a network that will compete with services already offered by the private sector." Yeah, they evolved, you know, back in mid-2005. Where were you? The blog entry notes that AT&T withdrew from Springfield, Ill., and were turned down by Chicago (Reardon says "dropped out," but I'm not sure that's the right nuance as I thought both EarthLink and AT&T made offers the city didn't like); their likely exit from St. Louis, Mo., isn't mentioned. Finally, Wireless Silicon Valley puts on a brave face, but did any of us know that Azulstar was the lead in raising money? I kind of thought that Cisco and IBM's involvement, as in Sacramento, meant that they were taking on some of the financing to assure the network would be built. The Sacramento partnership is facing the same travail. Could it be that Cisco and IBM here and Cisco, IBM, and Intel in Sacramento just signed on to sell and finance gear? It's happened before, but it's rather disappointing when blue-chip firms allow their names to be used on projects that are core enough for them to ensure they happen. Haw haw: Verizon Wireless agrees that advertising what I have called its "unmetered" cell data plans as "unlimited" is not the right term, and will change it due to action by the New York State Attorney General's office. The company will refund $1m to customers and pay $150,000 in penalties and costs to the state. They didn't admit any wrongdoing. The investigation found that 13,000 people nationally had their accounts canceled between 2004 and April 2007 for excessive use. In April, Verizon agreed to stop canceling accounts, and allow "common Internet uses." I've been writing about this issue for years and years. Read this BoingBoing post in which I chimed in back Nov. 2005, for one instance. A service advertised as unlimited, but which is actually limited, is not unlimited. NY AG Andrew Cuomo said in the press release, "When consumers are promised an ‘unlimited’ service, they do not expect the promise to be broken by hidden limitations." Their revised terms of service spell more out about what a reasonable limit is, including actual numbers, as well as providing examples of what they allow and don't allow. The word unlimited has disappeared. But they do the math wrong, as I've noted before. They note, "A person engaged in prohibited uses continuously for one hour could typically use 100 to 200 MB, or, if engaged in prohibited uses for 10 hours a day, 7 days a week, could use more than 5 GB in a month." No. That's one hour a day, seven days a week--not 10 hours a day--to reach 5 GB. 10 hours a day would hit 50 GB. Technically, "more than 5 GB" is accurate, but it's about as accurate "unlimited" was in the past. Update, 05-Nov-07: Verizon updated its TOS again to note that if you exceed 5 GB per month, they could throttle you to 200 Kbps. They could still cancel your account but at least they're spelling out penalties, and providing the potential of continuous service even if they have a bone to pick with you. Getting closer to actually serving the customer. They better watch out: they might actually do something in our best interests. The Linksys WRT600N sets out to offer what no router to date can (updates added 31 Oct 2007): certified Draft N networking simultaneously in the 2.4 GHz and 5 GHz bands: This is a neat feat, but requires two radios to carry out, and carries with it a hefty $280 price tag. In testing, I found a number of design choices and missing features, along with a lapse in the standards certification process, that make me suggest that users wait for firmware updates before purchasing an otherwise quite capable router. The WRT600N's closest competitor is the Buffalo Wireless-N Nfiniti Dual Band with gigabit Ethernet released in March for $250; it's not yet Draft N certified by the Wi-Fi Alliance, hence the Linksys unit's current uniqueness. (Read SmallNetBuilder's review.) 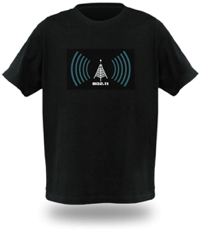 Update, 31 Oct 2007: Buffalo is currently enjoined from importing its 802.11a, b, and n gear into the U.S. The idea of offering both bands in a single router is simplicity: You can throw away old gear while preserving backwards compatibility and not sacrificing range nor throughput. Devices that can use the 5 GHz band and that you want to have running at full throttle can do so, particularly important for video streaming. This also allows you to reduce clutter, and to migrate older equipment to newer adapters as (or if) they're available instead of all at once. The Ultra RangePlus Dual-Band Wireless-N Gigabit Router (WRT600N)--to use its unwieldy full name--uses Linksys's EasyLink Advisor, a piece of wizard software the company has been rolling out gradually across all its models. (It can be downloaded and used with certain older devices, too.) While the EasyLink Advisor does streamline setting up a new router, troubleshooting problems, and passing out a wireless security key, it was also maddeningly slow in "discovering" the router it was trying to reach, to which it was directly connected via Ethernet on a modern, fast Dell laptop running Vista. I found it unable to configure an internal Intel Wi-Fi adapter to connect to the network, despite its assurance that it could do so. The router also offers the usual ancient Linksys interface behind the scenes via a Web browser for advanced configuration. I found for my basic purposes, the advisor didn't offer enough, and I expect that any user who finds the need for a dual-band, simultaneous 2.4/5 GHz router will also find the advisor inadequate because of specific settings they'll want to make "by hand." The WRT600N has four 10/100/1000 Mbps Ethernet ports. The case is a sleek black, with LEDs on the front that display the status of ports, the Internet connection, and Wi-Fi security (enabled or not). It has a single USB port to accept a hard drive or flash drive. The WRT600N succeeded in its primary goal in life: Providing access to two separate networks while shunting data over gigabit Ethernet to directly connected devices. 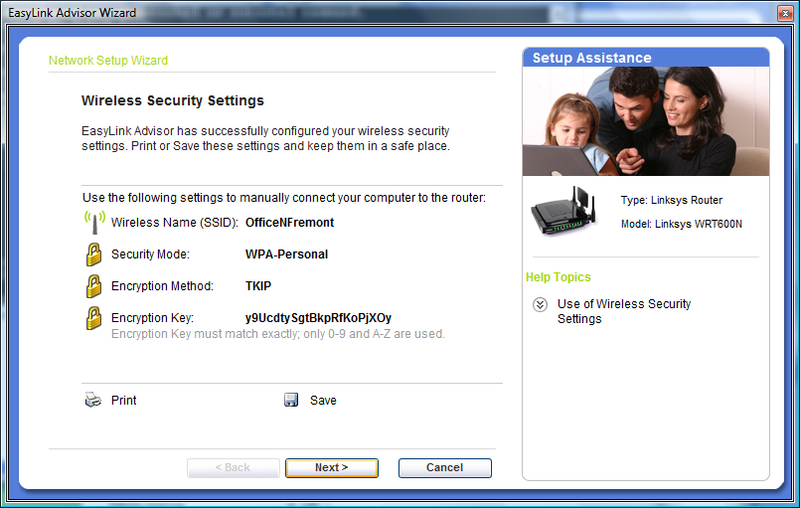 The 2.4 and 5 GHz networks can be set with unique names and have separate security options. In testing for throughput, I found that the WRT600N was highly inconsistent, but that's clearly due to my particular RF environment. Although my office is a mixed retail/office/residential building, and the neighborhood isn't that dense, we have some problem on channel 1 in 2.4 GHz that renders networks in that range completely unusable, regardless of vendor. A spectrum analyzer hasn't disclosed the cause. In 5 GHz, I see some strangeness at times, too. As a result, I can't benchmark devices with confidence when I see low or erratic numbers that don't hold up to repeated tests. Conversely, when I see consistent high performance in such a difficult environment, I can rely on the robustness of the device. In general, I was able to see speeds across 2.4 GHz and 5 GHz that should be expected from Draft N devices, but I'm declining to note them due to my test environment. Tim Higgins of SmallNetBuilder will have extensive, controlled test results in a few days which I'll link to. Update: These benchmarks are now available in Higgins's extensive review. I see that the number I saw aren't that far off from his more controlled tests. Now on to some specific concerns. Security. If you use the EasyLink Advisor, as Linksys expects many of its users will, you cannot choose your security key; the advisor creates a strong alphabetic-only key for you. That's great, but if you don't want to use the methods available for distributing that key to other computers, you have to type in a rather long set of characters. I would have liked to use Wi-Fi Protected Setup (WPS), as I now have a few computers that should be able to work with it. Unfortunately, in what appears to be a late decision in the release cycle, the WRT600N lacks WPS. There's a button on the top of the router that has a plastic laminated sticker around it labeled Reserved. I confirmed with Linksys that this release lacks WPS. It's a shame. I wound up using the advanced configuration to set my own WPA2 passphrase--which can be set uniquely for each radio--to make it easier to add computers. That worked perfectly. If you're trying to find the list of attached clients over DHCP, you use the DHCP Reservation button in the main Setup screen. It shows the client, and how it's connected: via the wired LAN or a wireless connection, where it shows which band it's connected via. Picking SSIDs. Linksys made a strange decision in having their EasyLink Advisor set the same network name or SSID for both the 2.4 and 5 GHz networks. For adapters that support both bands, there's no simple way to mark which network you'd prefer to join. I found in testing that Linksys's own WPC600N dual-band PC Card joined the 2.4 GHz network, and I didn't see a way to change that behavior. I don't know of any tools in Windows or Mac OS X that let you preferentially set the band for networks that roam across bands, not just routers. The advisor also won't let you choose an SSID which contains spaces, which is baffling. Linksys told me that this is due to legacy support issues as the advisor can handle older routers that cannot accept spaces in SSIDs. Sad that the advisor isn't smart enough to know which routers can and cannot, since spaces improve the legibility of a network name. Again, I went into the advanced setup and entered separate names for my two networks. That worked perfectly. Wide channels by default in 2.4 GHz. Linksys has chosen to release a router that's configured in opposition to the Wi-Fi Alliance certification standards; it's a loophole. Linksys ships the WRT600N set to use 40 MHz channels in 2.4 GHz by default, which means that when you turn the device on, you will interfere with double the number of networks that you would otherwise. The Wi-Fi Alliance Draft N standards say that the default should be 20 MHz, with manufacturers able to decide whether users can optionally enable wide channels. However, the alliance doesn't test for this (or even have a checkbox, apparently); Tim Higgins wrote about this last week. Update: Higgins writes on 31 Oct 2007 in his review of the WRT600N that he cannot observe the gateway dropping into 20 MHz channels as it should. If the WRT600N would follow the standard procedure of not transmitting using a 40 MHz channel when there's traffic present that it would step on, among other characteristics, that would mitigate this problem. It would essentially moot the issue, as despite being set to 40 MHz, the router would never use a wide channel if the wrong conditions were in place. There are three mechanisms in the Draft 2.0 version of 802.11n that are supposed to prevent Draft N devices in 2.4 GHz from sending data over wide channels in those routers that will support 2.4 GHz wide channels. I can't determine whether Linksys has implemented these mechanisms. It remains to be seen whether Linksys is acting as a good neighbor or an indifferent one. In the best outlook if the WRT600N doesn't back off to 20 MHz before transmitting, adding a WRT600N is like adding two 2.4 GHz Wi-Fi networks, which happens all the time. In the worst outlook, the default Linksys choice degrades the shared commons far more than it needs to, thus making everyone's experience in your airspace somewhat worse. Inadequate 5 GHz channel selection, but commensurate with everyone else. Linksys, like other manufacturers, supports just eight of the 23 possible 20 MHz channels in 5 GHz: the four lowest and the four highest, known as UNII-1 and UNII-3. The middle 15, UNII-2 and UNII-2 extended, aren't available. Apple made the same call. A Linksys spokesperson explained that because the middle 15 channels require additional FCC certification, a backlog in that testing has prevented the inclusion of these channels. Devices that use UNII-2 and UNII-2 extended frequencies must detect and avoid radar that's in use on some of those bands around the U.S. as part of the compromise that opened more spectrum up in 5 GHz. Apple hinted to me in August that something was afoot, too. Some changes went into effect in July for legacy channels (UNII-2) that seems to have slowed certification down. The Linksys router selects the optimum 5 GHz channel out of the four 40 MHz or eight 20 MHz it supports by default. But if you change the router's configuration from Auto to choose a specific channel, you are limited to just the lowest four (UNII-1). This is a bit baffling. Conclusion. A number of choices have led to this router being harder to set up for a user that might demand two bands than it should have been. The lack of WPS makes it more difficult to secure for average users. And Linksys's specific choice to release a loopholed router under Draft N certification rules is simply baffling. With firmware upgrades, I expect this router will shine. But I'll have to wait to see such upgrades before I could warmly recommend it. Ruckus's CEO interviewed in Forbes: Ruckus's Selina Lo is what we call a lively interview subject. This means, "she swears." Not excessively, but with great vigor when called for. She's a hoot to interview because Lo speaks her mind--and has backed up statements with products and actions that confirm what she's said time and again. This Forbes interview captures her company's positioning quite well. So Cisco and Intel aren't pulling dollars out of their pocket, huh? This is fascinating. I assumed that the blue-chip reputations and billion-dollar spare-change purses of Cisco and IBM might prevent Sacramento's Wi-Fi network from having the startup problems faced by other service providers. Uh huh. The Sacramento Metro Connect consortium isn't self-funding, which I'm surprised by. They're "closing in on the nearly $1 million" they need to get going, which has delayed the network's start. This article misidentifies consortium members, as far as I understand it. The Metro Connect partnership for Wireless Silicon Valley, which has had its last rites read even if it's not quite dead yet, includes IBM instead of Intel. This group in Sacramento is the reverse: no IBM. Or at least as far as I've known since the bid was accepted. The other two members are Azulstar and Seakay. Update: Reader George confirmed with the Sacramento Bee's writer that IBM was part of this group. I checked back to June, when the deal was announced, and all the sources then left IBM out; see this Wi-Fi Planet article and this Unstrung reproduction of a press release, for instance. IBM must have been added later, or omitted during initial phases? Azulstar just faced a major setback by having the plug pulled--or lack of plug?--in Rio Rancho, N.M., where after years of work they couldn't get a network running that met the city's requirements. This is the second attempt for a Sacramento network after a previous round in which the winning bidder withdrew during negotiations when the city asked for too much free service. The utility, working with smart utility meter firm SmartSynch, isn't looking just into automated meter reading, in which an employee would drive around and use Wi-Fi instead of eyeballs to pull up the current readers. Nor are they looking to replace the driving around part, too, with a city-wide network that could constantly read the meters. Rather, that's just part of a set of larger plans to allow management of load through participation of their customers, as well as potentially give those customers free Wi-Fi access as an incentive for meeting conservation goals. Customers will save money, too, by shedding load at critical times. The Wi-Fi network will be planned as a metering and residential service. Fletcher said the utility will install as many Wi-Fi nodes as needed to provide a good signal to the meters, and, by extension, to users within those locations. This means that outdoor coverage could be irregular, but it's not a focus. It also means that it's much more likely that there will be a high availability of indoor service compared to other networks that have to provide a generalized cloud and ensure indoor and outdoor signals. Smart thermostats are in some use and have been talked about for years, but linking them into a live network has been the problem. I asked Fletcher why the utility didn't opt for broadband over powerline (BPL), which always seems to be next year's breakout technology. The reason was simple: BPL follows the same path as power, and a power outage would prevent them from using the network to control substation switching. Wi-Fi, which could be powered through back-up batteries, could continue to function and reach otherwise cut-off shunts and telemetry. The metering Burbank will put in place will let them first assess how power is being used, and then use that to create a plan for how to best even out demand. This could include huge incentives to some customers to replace ancient air conditions, as some utilities do now to promote efficiency, but also offering free Wi-Fi as a carrot. The utility gets to leverage its existing field workers, mapping data (which includes trees in the rights of way and building outlines), fiber-optic network, and utility pole and other rights of way ownership. Their meter readers will fan out with GPS devices, and gather the location of every meter in the city over a few month period, and that data will be directly integrated into their existing GIS system. They also have the advantage of having giant movie and television studios in their town that use a lot of juice: The top few companies use 25 percent of the electricity; the top 200, 50 percent of the town's juice. The rollout is planned in four phases, which increase in cost. Phase 1 was a $50,000 technology assessment that's finished. Phase 2 involves spending $50,000 on a pilot test on the utility's 20-acre campus. They then move to phase 3, in which they'll spend $1m, and capture a good portion of the power usage. Because big customers are involved, the utility estimates 80 to 100 Wi-Fi nodes will cover just 80 to 100 meters. Finally, stage 4 will cost about $5m and cover most of the 18 sq mi town. Burbank, as I noted above, has a fiber-optic network already spread throughout the town. They use OC3 SONET now, an older 155.5 Mbps standard, and will retain that while overlaying 10 gigabit per second Ethernet with equipment from Cisco. This will allow them to feed all their Wi-Fi nodes or mesh clusters rather easily, but also gives them an additional line of revenue for their Internet service operations: studios will likely buy access for transport. Burbank will also invest in a high-definition transport intertie with firms that specialize in moving television data around over long distances. This idea in Burbank is rather powerful because it's not just another municipal Wi-Fi network. Rather, there are specific applications already justified for long-term cost savings that will be put in place. Wi-Fi access will be an extra, and while a component, not the critical one. Not every utility could make this work: Having fiber in place and a well-understood future goal and squeeze on power generation make a perfect storm in which Wi-Fi fits in this Southern California town. DS2 announces 400 Mbps electrical standard offering: It can carry 3 HDTV and 2 SDTV streams at the same time. Which is depressing that any household needs five simultaneous TV streams to be happy. Powerline networking for the home has multiple proprietary standards and one industry-supported effort called HomePlug. There's been no coalescing or consolidation, unfortunately. A fair amount of powerline and similar home networking technologies are used for distributing IPTV, rather than used solely for home purposes; that means a service provider tends to provide the equipment, and interoperability isn't an issue. The BCC reports that British Telecom uses WEP on its home networks: I'm not sure whether BT enables WEP by default on their home Wi-Fi routers, or if you can't upgrade to use WPA or WPA2 at all. However, this makes the WEP crack that will be discussed by AirTight researchers at ToorCon this weekend all the worse. I tend to think of WEP as so 20th century--something used only in despair. In fact, this BBC article makes clear that WEP is still in wide circulation because of compatibility issues. I think of Windows XP as the default operating system for Windows users; there are still plenty of pre-XP home users out there, too. (WPA can be used on some pre-XP systems, depending on drivers and other factors.) The other day, a colleague received email from a graphic designer who uses Mac OS 8.6 and is still happy with it, but is considering updating. That's a nearly decade-old system release. I suppose I'm too sanguine about WEP's availability. The British spectrum regulator has set preliminary rules for in-flight mobile device use (voice and data) with picocells onboard, but sets 2008 as first deployment: Ofcom says that mobile devices may be used at an airline's discretion at altitudes of 3,000m (10,000 ft) or higher. On-board picocells would be required. The initial process will include only 2G services, which has been expected all along, so GSM voice calls and GPRS data using 1800 MHz only. 3G would come later, if 2G tests out fine, as it uses other frequency ranges. Ofcom is looking for feedback by Nov. 30. Although Ofcom represents just the UK, they are working with other EU member states to create a regime that would common across the entire set of territories. Such a decision is expected by late 2007 or early 2008, Ofcom notes in the executive summary of its request for comments. InfoWorld has a write-up on an upcoming Toorcon presentation by Vivek Ramachandran and Md Sohail Ahmad: The AirTight Networks researchers have developed an attack they call Caffe Latte; it uses a laptop's attempts to connect to WEP-protected networks as the jimmy that lets the cracker into a position to force the laptop to issue tens of thousands of WEP-encrypted ARP requests, which are used to crack the network key. Caffe Latte lets the attacker then act as a man in the middle, providing Internet access from another network while examining the victim's computer or installing payloads. This attack can be used anywhere: while whiling away your time at a cafe, you could be cracked, hence the fancy name. Update: Astute readers noted that this specific attack first appeared on Darknet.org.uk as Wep0ff in January 2007. I'm not sure from the InfoWorld article whether there are any differences between that tool and the Toorcon presentation. Another update: See comments; Ramachandran says their attack is different, and the full details will be revealed at the conference. The application of this attack is interesting, because although the article and Ramachandran/Ahmad's Toorcon description talk about business use of WEP, actual WEP use by corporations is pretty limited. Most companies of any scale are using some form of 802.1X or other credential-based logins which can't be subverted by this attack. Companies in retail and logistics are apparently the most vulnerable, because early Wi-Fi built into retail point-of-sale systems and scanners used in warehouses are still in wide use, and can only support WEP. If a cracker can associate the cracked key with a company by scanning the victim's hard drive or using other intrusion tools, then they can go to that company and enter their network at will, too. That's what led to the TJ Maxx/Marshall's parent company break in. The broader implications are that if you ever attached to a WEP-protected network and stored the key, your laptop is now vulnerable to this attack. This may lead people to turn their Wi-Fi radio off when not actively attached to a network when out in public. (It's a good idea for reducing battery drain, too, of course.) The researchers are using an older form of WEP attack, it seems like, as they suggest it could take up to 30 minutes to break the WEP key in this manner; other researchers revealed a method that works in as little as under two minutes back in April. The vulnerabilities exposed by this attack arise because the IP ranges associated with Wi-Fi networks are often considered trusted networks by firewall software. Most firewall software requires that you agree or disagree that a particular network range represented by a Wi-Fi network that you connect to is trusted or untrusted. I suspect most users add the network to their trusted category when they connect to a network, assuming it to be safe--maybe the case when it's a home network. Which means that popular private addressing ranges starting with 10.0 or 192.168 are already approved in your firewall. With the attacker managing to appear to your computer like a WEP network it's already joined, they may not be blocked from probing for the many weaknesses typically found on most Windows computers through outdated software and drivers. Nokia announced the N810, the latest Wi-Fi-equipped tablet PC: The tablet will ship in November in the US for $479. The Linux-based device allows third-party software, including now Wi-Fi hotspot management and hotspot network software from Devicescape and Boingo announced in the last week, but mysteriously (until now) not available on tablet systems until November. The tablet can be connected over Bluetooth to a cell phone for cell data connectivity. The N810 includes Skype, a camera, and a GPS with maps. Colorado Springs, Colo., buys downtown Wi-Fi network for $10: The city purchased about 40 nodes from SkyTel Corp. which had decided its trial of a Wi-Fi network didn't attract enough paying users. It was apparently cheaper to sell the equipment than to unmount it. The city assumes a utility pole lease, too. This article says that Colorado cities can't resell public access, so the city will use it to test public safety and municipal applications. Christian Gunning, Boingo's head of marketing, said that while Nokia's S60 and N Series phones weren't well known in the U.S., that they were "widely available and widely successful" elsewhere. Subscribers typically pay the full cost for phones in Europe, and users aren't limited as to what they install on them. That means that VoIP over Wi-Fi isn't an unusual application, and Boingo can enable that by providing the network at a predictable monthly cost. The deal also allows Nokia's multimedia phones and tablets to access streaming and downloadable media over Wi-Fi at a much lower cost than with comparable laptop-oriented Wi-Fi deals, including Boingo's own U.S. and international unlimited plans ($22 and $39, respectively). I took the opportunity to talk to Gunning about the company's current strategy. Founded in 2001, they've been pursuing their aggregated network approach for nearly six years; I first wrote about them in Dec. 2001. Gunning said that to ensure quality on their increasingly large and non-U.S. aggregated network, they contracted with a third party, Lionbridge to handle not just localization--customizing their applications and Web sites for other languages and countries--but also worldwide testing. "We contract with them literally to jump on planes and go from country to country to country with laptops and handheld devices and do quality testing on major networks around the world," Gunning said. Boingo tried to handle this in house and on an ad hoc basis, but they couldn't achieve the level of quality from the platform partners, Gunning said. As I have explained to the many people over the years who have asked me how Boingo made money selling subscriptions at retail, Boingo is the private-label backend or hotspot component for products sold by Fiberlink, Verizon Business, and most recently, Alltel. Through this testing, Gunning said that Boingo was able to help its hotspot partners to achieve better results, but also that they were able to remove a handful of locations from their directories that they couldn't guarantee consistent performance on. "We can monitor if there's a specific SSID or a specific venue ID that's consistently failing," said Gunning. Because Boingo has been in a position to work with networks worldwide to improve their consistency, I asked Gunning where 802.1X--a standard network authentication method widely supported for enterprises--stood in terms of hotspots. "802.1X in hotspots would be a phenomenal boom for the end user in terms of security and safety," he said, but besides a handful of networks like KT in South Korea (which requires it), and T-Mobile (not a Boingo network partner outside its airports), and iBahn, there's not much uptake. On the financial front, Boingo remains privately held and close lipped. Gunning noted that Deloitte & Touche had recently given noted that Boingo was the No. 2 company in the Los Angeles area for growth over a five-year period. This gives us a glimpse into their revenue, as firms must have had over $50,000 in yearly revenue in 2002, and over $5m in annual revenue in 2006. The accounting firm privately checks out a firm's books to determine revenues and other factors. Boingo was reported as having a 13,398-percent growth over that period, which means that assuming at least $50,000 in 2002, they have nearly $7m in revenue by 2007. It's more likely that they had over $50,000 revenue in 2002, and thus are probably above the $20m range now, including Concourse Communications revenue. That would represent something like a few tens of thousands of regular subscriptions and some hundreds of thousands of one-off purchases at airports. While Gunning wouldn't confirm a precise amount, he stated that it is well above that mark. Gunning also said that "we are cash flow positive; we have a sustainable business." Gunning said that the acquisition was a way for Boingo to expand its retail identity while also gaining chits that would allow it to expand its networks. He noted that some unique network deals that the company assembled required reciprocal roaming: Boingo could include these networks in their aggregated footprint by also extending access to those operators' subscribers when they roamed to Concourse-managed airports. This has given Boingo some exclusivity over competing hotspot network components offered by firms like iPass. Related to that, I asked Gunning if the evil twin problem at O'Hare and elsewhere was true or overblown. In this scenario, travelers see a network name called "Free Wi-Fi" or a variant when they check on available Wi-Fi. Some security researchers have checked and seen that these are ad hoc networks. Gunning confirmed that there is a virus or viruses in the wild that are tailored to advertise an ad hoc network, and then transmit various payloads, such as spam zombie software or other keyloggers, to any vulnerable computer that connects. It also "turns your machine into a free Wi-Fi hotspot broadcasting ad hoc machine to spread the virus," further propagating itself. It's been interesting to follow the model that Boingo founder (and EarthLink founder) Sky Dayton promulgated back in 2001, that the goal was to fill pipes, not to build networks. Dayton saw a distinct difference between the two tasks, an unpopular view at the time as companies were started that tried to pursue retail brands for their particular small number of hotspots. While T-Mobile and a few other companies do still have a strong retail Wi-Fi association, frequent business travelers have tended to move towards a subscription model with whatever the best and most well traveled set of hotspots they have can cover, whether AT&T WiFi, T-Mobile, Boingo, iPass, or others. Gunning echoed Dayton's words when he spoke about how the company views itself: "We're all about being a big, fat dumb pipe to do whatever you want." The BBC has partnered with The Cloud to make its online services available free at the network's 7,500 hotspots: BBC offers a variety of programming, including TV program (programme) downloads, through its Web site. A special Windows-only player will be supplemented with Mac OS X and Linux versions later this year, and Flash streaming will be offered, too. Downloaded programs can currently be kept on a computer for up to 30 days. At The Cloud locations, streaming and downloading will be available at no cost, but will require a laptop. They'll expand to portable devices like the Nokia N95 multimedia smartphone in the future. The BBC says they have 250,000 regular users of the iPlayer software. Ah, how quickly they forget the first time around: AT&T Wireless once installed Wi-Fi at six Amtrak stations across the Northeast Corridor, but I don't believe it worked very well. The manager at Baltimore's Penn Station quoted in this Baltimore Sun article said they'd "experimented with a Wi-Fi connection." Hrmphf. In any case, AT&T Wireless became part of Cingular and now is just AT&T (wireless), and they've shed some of offering along the way. The new Amtrak station Wi-Fi is run by T-Mobile, which doesn't forget that Wi-Fi is part of its business, and can also be found at the other Penn Station in New York City, 30th Street Station in Philadelphia, Wilmington Station (Delaware), and Union Station (D.C.). The same station manager might be talking out of turn when he confirms a reporter's question about Wi-Fi on the trains. Amtrak has been rumored in the past to be considering it, but there are few trains in the U.S. that have any form of Internet access on board, and many projects have gone awry in recent months. I expect Amtrak would prefer that they make that sort of announcement directly. There's enough 3G along the Northeast corridor that it's likely a cell-based, somewhat continuous service could be offered with EVDO Rev. A backhauling it. A typo in the article might reveal the heights to which Wi-Fi hype can climb: an expert consulted estimated "500,000 million" people use Wi-Fi worldwide. Adding the hyphen in makes that statement so much less interesting. But it's also less accurate. Tens of millions of people use Wi-Fi worldwide, not 500,000 to 1,000,000. Novarum has released a limited set of its first-half 2007 findings while testing metro-scale Wi-Fi and cell data networks: The rankings are fine, but I'm more interested in what they discovered while performing their tests. They discovered that high-powered Wi-Fi adapters really do make an appreciable difference in providing an improvement in coverage and performance--something that's not always been clear--but were surprised to find that regular-power 802.11n adapters have about 2/3rds of the high-powered radios' advantage in reception and throughput at much lower cost. Novarum's other key findings are that even more than 40 Wi-Fi nodes per square mile are needed for something that approaches 100-percent "service availability," a term they define as providing the ability to access the network and perform tasks, as opposed to just presence of a signal; and that 3G cell data networks continue to improve on performance - measures of bandwidth - even as they excel in service availability because of client hardware's ability to drop down to 2G service where 3G is unavailable, keeping a seamless connection. Phil Belanger and Ken Biba, Novarum's founders, date back to the early days of Wi-Fi and wireless networking. They've been through the ringer in several firms, and started testing Wi-Fi networks in 2006 with the idea of selling reports to cities and companies on a spec basis--conducting the studies and then finding buyers for the data--and being hired to perform independent audits or competitive analysis. They decided to start making reports available for a la carte purchase (beginning today), along with continuing to sell subscriptions for their full feed and custom work. Belanger said that, notably, Philadelphia's EarthLink Feather network had improved dramatically since their last tests when it was just out of its pilot stage. "EarthLink is doing what the new CEO said; they're going to stay in the current footprint and make that work," Belanger said. Novarum measured a 50-percent increase in node density over last year's tests, and saw "much better service availability" in the covered area. Speeds of nearly 1 Mbps downstream aren't unusual. Novarum dubbed the Philadelphia network "most improved." Mountain View, Calif.'s network, run by Google on a free basis, has also improved tremendously since their last visit in 2006. Belanger said that Google and its hardware provider Tropos were treating the town like a lab, constantly tweaking the network. A strange bit of interference in the 2.4 GHz band in Mountain View has required both companies to adapt. Node density is now at about 43 per square mile, but a combination of other tweaks and firmware upgrades boosted throughput: "The dramatic improvement was in performance," Belanger noted. I asked about Portland, Ore., the only major city in MetroFi's deployment plans at the moment, and where it was recently revealed by the mayor's office and confirmed by the firm that without a change in the city's commitment or an infusion of venture capital, the network will grow only slighty beyond its current mostly-downtown footprint. Belanger said their testing found poor availability and lots of inconsistency in Portland's Wi-Fi service. In their first test, they found service availability in Portland with a regular Wi-Fi client in just 30 percent of the locations they tested. (MetroFi publishes a full-disclosure coverage map, so there shouldn't be any ambiguity about live areas of the network.) "We were so disappointed with the results, that we've gone back and tested it again" in the third quarter of 2007, wondering if they had just hit a bad day on the network. But the results were consistent. Their single biggest conclusion from testing dozens of networks is that service availability remains metro-scale Wi-Fi's biggest weakness compared with cellular data networks. In the cities they've tested to date, cellular service availability was 100-percent across 15 municipalities, while only the St. Cloud, Flor., network among Wi-Fi services reached that 100-percent mark (requiring a high-powered adapter). On average, cell networks had 87-percent service availability; metro-scale Wi-Fi, 71 percent. Sprint Nextel and Verizon's EVDO Rev. A upgrade also showed an appreciable improvement in speed in areas they tested before, running 20 to 30 percent faster, and making the difference between metro-scale Wi-Fi speeds, which tend to run below or well below 1 Mbps downstream and 3G cell data networks even less pronounced. The gap in price (Wi-Fi being from free to $20 per month; cell data, $60 to $80 per month) and the lower service availability of Wi-Fi in supposedly covered areas reamining the biggest differentiator. This should move coverage into a more important part of the service matrix as providers decide where to spend money. Belanger said that through continued testing, they're finding that slightly north of 40 is even better at achieving service availability, and that if a network has good uptake, additional nodes would have the added advantage of keeping throughput high. Belanger said that with the service availability in most cities they tested - remember that 71 percent was the average - "It's just we're not there at that threshold where it appears to be a solid service." He noted, "At about 85% is about the area where it's going to appear like a robust service, you'd actually pay for it." This time around, 9 of the top 10 slots for best overall networks, combining their various measures, were occupied by metro-scale Wi-Fi networks, although most required the use of a high-powered 802.11g adapter to achieve those marks. Those adapters are built into Wi-Fi bridges provided by Ruckus and Peplink, and which service providers recommend. In comparing availability and performance between a regular adapter and the high-powered one they tested, they found a 36-percent improvement in performance and 38-percent improvement in speed. But their big surprise was in testing a generic, inexpensive, regular-powered 802.11n adapter against a regular 802.11g Wi-Fi radio: performance jumped 20 percent and availability, 26 percent, with 802.11n. Belanger noted that with performance that high from 802.11n and on an asymmetrical basis--the Wi-Fi networks are still pumping out old 802.11g--that it's a good sign for the future as people move to 802.11n. He said that equipment makers told him the improvement in speed is a bit of a mystery. Even with "better radio chips, a better antenna, multiple antennas more cleverly used," that there's "probably also other things like the way it does associating and roaming from one AP to the other" that help. In any case, an 802.11n USB adapter for Mac OS X and Windows weighs in at about $60 to $70, while Peplink and Ruckus bridges run $100 to $400. As they plan for the future, Belanger said that both mobile devices--specifically the iPhone--and mobile WiMax loom large. The company is now testing with an iPhone because the device has built-in seamless handoff between 2G EDGE and Wi-Fi networks. This lets the device have a much better overall service availability figure even when a Wi-Fi network is spotty. Likewise, pre-WiMax technology like Clearwire and mobile WiMax technology appearing next year will figure into their testing. They've already scanned Chico, Calif., and Eugene, Ore., with Clearwire's current gear. While there are other firms that audit and test wireless networks, Novarum appears to be the only company revealing as much information publicly; they may be the most extensive testers of Wi-Fi networks, but they're certainly the most frank. The Detroit News rounds up three large-scale projects in Michigan, each of which is facing its own challenges: The writer is rather kind when she writes, "St. Louis, Chicago and San Francisco recently scaled back projects because of low demand and problems with providers." (St. Louis is still because of utility pole electricity issues; Chicago rethinking; SF, up in the air.) Projects in Oakland and Washtenaw counties are still quite limited and well over a year behind schedule, but the providers for each say they've overcome difficulties. Oakland County's MichTel Communications-run effort has 13,000 users, but those are largely using an ad-supported, free flavor; subscribers number in the "hundreds," the article says. At one point, MichTel was talking about an early use of mobile WiMax; I haven't seen any news on that front since their first announcements. Washtenaw has covered 15 sq mi in cities like Ann Arbor, but only 700 registered users and 80 users who have paid for an upgraded service. The county has 344,000 residents, and the project is still planned to cover 720 sq mi. Macomb's network, built by MICA Networks, hit a snag in that the city--the company says in this article--couldn't ensure continuous rights to sites where they're locating Wi-Fi nodes, making the company uninterested in expanding the network. Another classic from satirical newspaper The Onion: "Griffin was confident that NASA's estimated $655 million plan to install a wireless broadband router by 2017 could reap huge benefits for the entire space agency." Update: 2008-09-24: It has come to my attention that links to this post are attempting to paint me, after the fact, as being wrong about everything because I said Starbucks wouldn't offer free Wi-Fi in 2008. This requires me to set the record straight. In the post below, I spell out why Mike Elgan was incorrect about Starbucks planning to give Wi-Fi away for free. I stand by that logic. What happened, rather, is that Starbucks switched its provider from T-Mobile to AT&T, and both firms are giving away service--but not quite at no cost. AT&T is offering free Wi-Fi to all its DSL subscribers and fiber-optic customers. They receive monthly fees from those users, and turned on the Starbucks tap (along with 10,000 McDonald's locations they purchase access to from their services partner Wayport) as a way to reduce churn. It's a marketing expense, and not very expensive. It's not free--it's free to AT&T high-speed subscribers. Starbucks isn't paying for that "free" service. Likewise, Starbucks isn't giving away access; they're rewarding loyalty. Again, it's a marketing expense. You have to make a purchase every 30 days on a Starbucks Card to obtain two continuous hours of access each day for the following 30 days. That's a bonus, but it's not precisely free. In both cases, the companies get a windfall from providing a service at no extra charge. Elgan and others were speculating that Starbucks would go entirely free: no purchases, no loyalty, no cost. Didn't happen. As I note in the conclusion below, Starbucks would have had to pay millions to T-Mobile to offer a no-cost network; instead, the deal with AT&T is clearly more favorable. Starbucks may have negotiated some or no payment for its own loyalty program, but over 12m AT&T subscribers were brought onboard by that firm, which certainly was a motivating factor for Starbucks to change over. I don't mean to be picky, but free Wi-Fi at Starbucks? Ha. It. Didn't Happen. Mike Elgan, who, please note, I like and have worked for and with in the past, so don't take this wrong, is bloody foolishly wrong: Elgan predicts that Starbucks will drop its fees for access in the next year. Ain't. Gunna. Happen. Let's get to facts about who operates this network first. Elgan says that Starbucks offers Wi-Fi along with partners T-Mobile and HP. Now, I don't know how HP wound up getting its name inserted in there--Compaq had a multi-year supplier deal with Starbucks that HP acquired in the merger--but T-Mobile is the Wi-Fi provider; Starbucks is its customer, perhaps branded as a "partner," because Starbucks remains the single largest tenant on the T-Mobile USA HotSpot network, and a significant customer in Europe, too. Elgan says we get free Wi-Fi of a sort already: with the right gear, you can buy songs from Apple via iTunes over a Starbucks-located T-Mobile hotspot. Right. And I can drink my own coffee in Starbucks, too, as long as I purchase it from them. Not really the same as free Wi-Fi when it's simply an alternate retail delivery channel for digital media--not Internet access. The reason that Elgan thinks that Starbucks might go free is because of McDonald's: the two giant chains now compete in some categories, with McDonald's providing pretty good coffee and Starbucks offering things that resemble upscale Egg McMuffins. This rollout started in 2004 after a heated competition among Cometa, Toshiba, and Wayport. Wayport won. Toshiba exited the business. Cometa shut down. Man, I wrote a lot about that back then. How soon we forget. Also important to recall that McDonald's is organized into national divisions, and it's unlikely that a directive would spread worldwide for something like Wi-Fi access, which intersects with culture and technology in each country. Ditto, T-Mobile, which has a separate U.S. organization, and sells hotspot access on a separate basis in the U.S. from its European operations. (There's a roaming deal that's purely on a metered basis between T-Mobile's European and U.S. Wi-Fi customers.) In the UK, hourly charges for Wi-Fi are ridiculously high (several pounds an hour isn't unheard of), and there's a countervailing movement to bring more free Wi-Fi to the front, as well as inexpensive unlimited plans; thus, McDonald's UK hopping on that trend. I have never had a conversation with T-Mobile about its hotspot network in which it wasn't made clear that they were perfectly happy, if not occasionally ecstatic, about the usage, its growth, and the resultant effect on their segment of the corporate bottomline, even though I've never been told dollar figures. Occasionally, T-Mobile releases usage numbers, and they're awfully good. That's partly because T-Mobile's network is designed to reduce churn and retain customers. Customers who pay the $30 per month as voice subscribers for unlimited EDGE and unlimited Wi-Fi must be fairly happy--and they're not paying $6/hour to use a Starbucks Wi-Fi network, either. If Starbucks went free, T-Mobile would lose a large portion of its customers paying it for unlimited Wi-Fi. And their churn would increase. And they'd lose the portion of walk-up dollars, which is probably a decent amount in the several airports they cover. Thus Starbucks would need to pay T-Mobile a fairly significant amount of money, perhaps tens of millions of dollars a year, if that money could begin to cover long-term customer retention on top of real revenue. AP tech writer Peter Svensson says that Belkin's worked, Iogear's is flawed, neither is worth the cost: If you're thinking about being an early ultrawideband (UWB) hub adopter, Svensson is more or less saying, is it worth $200 to replace a single cable? I tend to agree, although I'm glad some product is on the market. $200 for a USB 2.0 hub that requires AC power on one end and a Windows driver on the other seems a bit much. Svensson was able to get Belkin's hub to work just fine and approved of the speed. Iogear's suffered from flaws, though the company acknowledged this and promises revised drivers. With the approval this week of 12 platform reference designs from major makers that conform to the WiMedia Alliance's core specifications, expect that within 3 to 6 months we'll see the "real" UWB: adapters designed to work with many different kinds of devices; the ability to pair equipment and mix and match adapters; and adapters built into some early, higher-end peripherals. UWB can operate at rates of up 480 Mbps over a few feet, and will best work when and if UWB radios are built into cameras, printers, and hard drives as an alternative or supplement to wired USB 2.0; and when PCs are sold with UWB as a standard option (like Wi-Fi and Bluetooth) or as a cheap upgrade. My essential problem with Fon is that there's no good way to determine how many of what they describe as nearly 200,000 Fonero locations are really hotspots rather than an antenna sticking out of a house or some inconvenient location. To me, a hotspot is a spot with high backside utility. If I can't sit down, potentially get electrical usage, but at least sling my bag somewhere, I can't work productively for long. Making a phone call requires little backside utility. You can stand and walk around the pavement to make a call, often in inclement weather, as long as ambient noise isn't too high. But at 11 pm in a residential neighborhood, you're unlikely to make that phone call--or the police might be called. In speaking recently to the BusinessWeek editor who wrote up the Fon/BT deal, I tried to explain how I debate Fon's count of 200,000 locations as comparable to 200,000 hotspots, because Fon doesn't have airports, convention centers, downtown hotzones, parks, or metro-scale networks. All of those vary among their backside utility, the captive-user potential, and the public-access-without-harassment possibility. But they're all large. Access across 1m sq ft of an airport isn't comparable to a sliver of use on a street in Barcelona outside someone's apartment. Thus I was remiss in my discussion of the BT deal in mentioning that Fon could be a key improvement in BT's converged calling (unlicensed mobile access or UMA) service called Fusion. BT spun off its cell side, so in order to make Fusion work, they need as many minutes spent at home or at OpenZone hotspots to keep from burning up GSM minutes. If a good hunk of BT's wired DSL customers flip the Fon switch, then there is, in fact, a high probability that a Fusion user would see a dramatic improvement in how few minutes were fried via GSM. This reduces BT's cost and improves a Fusion subscriber's monthly bill, too, if they would otherwise have gone over their minutes' pool. They would likely see better coverage in areas with poor cell service, too. So while I want to emphasize that backside utility and public use without harassment are two factors in how you might say whether a location is a hotspot or just lukewarm, applications are a critical component. If I need to look up a fact on my smartphone, and I can use Wi-Fi to do so via a Fonero's network, that's very high utility and I don't need to sit down or linger. If I want to spend 60 minutes reading email on a laptop, I need a seat. Devicescape scores deal with world's largest handset maker to ease users' connections to Wi-Fi hotspots: Devicescape's middleware lets a user connect to a hotspot--their own or a public one--with very little fuss, using a single super-account that consolidates all other Wi-Fi and hotspot network passwords and accounts. Nokia has been inserting Wi-Fi into an ever-increasing array of devices, which makes Devicescape a perfect match. The deal between the two first puts Devicescape's Nokia-tailored software in a download area for the N95 smartphone and their tablet PC series that includes the N800. AT&T spends $2.5b for 12 MHz across 200m people in the 700 MHz band: Let's talk two-steps-ahead. In the terms for the C Block licenses that Google wanted very open and Verizon and AT&T wanted to have cell-spectrum-like restrictions, AT&T did a volte-face and said it would agree to most of the openness that Google wanted. Huh, I said, I wonder what made them do that? Well, it's gamesmanship. AT&T was obviously already in a position to acquire Aloha Partners's licenses. This means that AT&T is reverse-encumbering the other band. While the C Block involves more bandwidth and greater coverage, Verizon is now in a worse position because of the lack of device and application lock-in if they choose to bid in 700 MHz as AT&T will already have holdings. AT&T can have the flexibility to deploy different services in the different 700 MHz blocks. I think. Comments welcome. The storm broke over Meraki Networks change in pricing and services over the weekend, but skies seem to be clearing a bit: I wrote yesterday about how the mesh networking firm was raising its prices for its node for networks that required user logins and wanted to charge users for the service, and how many community networks were up in arms because of a lack of notification. I was surprised by it all because Meraki has had a strong community focus. According to Sanjit Biswas, the head and a founder, a fair amount of miscommunication led to the ire expressed. They've spoken to many of the networkers involved, and things are calming down. Biswas said this afternoon that although the firm had called about 850 customers before they pushed new material to the Web site on a tiered pricing structure and a transition plan for existing networks that they clearly missed some people who then felt that they were being told of a fait accompli. The forums exploded a bit, and Meraki didn't respond there initially. "It's really our fault for not posting more heavily on the forum," Biswas said. He's trying to remedy that now. The Web site soft launch was intended to promote discussion which Biswas said they would use to forge the final plan; it just came a little faster and more intensely than they expected. The new pricing structure for Meraki leaves the $50 indoor and $100 outdoor nodes for Standard edition networks only, which have no fees for access, and have no user accounts. An ad bar is required. Biswas said that they didn't understand how much many of these networks rely on local sponsorship, often in-kind splash screen advertising, and they'll modify the the Standard edition to allow multiple splash screens, as well as sponsorship messages in the ad bar that will appear in Web pages. They're also adding back more extensive whitelisting, which allows a device without a Web browser to connect to a network without viewing a splash page. The Pro edition, which features $150 indoor and $200 routers and includes six months of email support, had a mistake in its description, which was part of what angered many forum posters. Biswas said that displaying advertising that Meraki collected revenue from would be an option not a requirement for Pro users. That takes a bit of the sting out there, I'd imagine. Biswas said that until they have a sense of volume and behavior, Meraki doesn't want to promise a revenue share as they don't know how much or in what form they can offer it. This fix helps differentiate the Standard and Pro edition better, clearing up a point of confusion on my part: Standard is ad-subsidized; Pro is full support, full cost. What Meraki calls Legacy networks, which use nodes sold before the changes go into effect, will have more options for how they proceed, too, instead of what was previously a choice to add new Pro nodes or convert the entire network to Pro. They're working with individual networks on these issues. "Existing customers who bought stuff from us don't have to change," Biswas said. Biswas had earlier told me via email that part of the issue with raising price had to do with resellers, who they expect to rely on more in the future for sales. At $50, there wasn't enough money in the system for a retailer to package a system with support or discount nodes for volume. At the higher price, where Meraki expects integrators and resellers to include support, there's a lot more flexibility. Biswas said that he expects to see Meraki Pro edition nodes sold below $150 on a one-off basis by retail partners within a few months, as well as resold by network builders. Outside the U.S., he said, channel sales become particularly important. "There's something to be said about buying in Brazil from a Brazilian reseller," he said. Biswas noted that in the future, they'd try to communicate changes in advance of those changes, so that their customers didn't view updates as the final word before that was the case. "Lesson learned," he said. The WiMedia Alliance has a slew of announcements today on certified devices: The ultrawideband (UWB) standard for personal area networks (PANs) that's emerged under the guidance of the WiMedia Alliance hit a big milestone today, one that will finally bring us closer to a bunch of interoperable and interesting devices on the marketplace. Twelve platforms from the whole range of UWB chipmakers and system designers were certified by the group for its Common Radio Platform. What that means is that at the physical (PHY) layer and the media access control (MAC) layer, devices will interact to avoid interference, handle coordination, and work together. This is a big milestone that goes beyond the Certified Wireless USB announcements in the summer, as the USB part is an application, or a type of data standard that runs over the MAC layer, which in turns uses the PHY for communication. This interoperability is a key part of establishing the broad range of devices and applications that work together. With certification set, end-user equipment makers or OEMs can start integrating UWB without fear that silicon would need to change or that a consumer electronics device would suddenly need a firmware upgrade, which is typically problematic on mass-market devices that lack interfaces for easy upgrade. These platforms that were certified are complete modules which can be tied into existing devices, like a mini-PCI or smaller form factor. At some point, UWB winds up being a chip that's just soldered right on the main board of a device, but that kind of integration typically comes far later than module-based add-ins. UWB in this first form offers speeds of up to 480 Mbps within a few feet, and 110 Mbps at up to a few dozen feet. While the focus is on the Big Four cell operators, don't discount Alltel, which has unlimited EVDO and now a Wi-Fi plan: Alltel is a smaller carrier but a significant one because it owns licenses and operates EVDO service in areas that Sprint Nextel and Verizon don't cover. This complementary access allows Alltel to offer unlimited EVDO on a national basis using the other carriers' networks as backup and still price it at $60 per month with a service commitment. Their addition of Wi-Fi tacks $10 on per month if you're already an EVDO subscriber. Alltel is reselling Boingo Wireless's network, and pricing it on a walk-up basis at $22 per month for unlimited domestic U.S. access, just as Boingo itself offers. This is rather enlightened, I must say. AT&T treats its consumer division AT&T WiFi network like a red-headed stepchild (no offense to red heads or stepchildren)and Verizon and Sprint offer Wi-Fi with a bit of disdain. T-Mobile, with its lack of 3G service, is the only cell carrier to take Wi-Fi seriously because it has to. Meraki has changed its pricing and feature model for its mesh networking system, angering early users: Exiting its beta, Meraki has changed its pricing and service model, while requiring the display of advertising and a piece of the action for handling billing. This abrupt change, announced quietly last week, has resulted in a nascent networker revolt. It may be that early infrastructure builders abandon Meraki because to continue expanding networks, their cost structure has gone way up while control has gone way down. The two basic nodes that Meraki sells, Indoor and Outdoor, were priced at $50 and $100 during the beta. The beta flag is gone from their site, and while you can still buy the nodes at that price, many features formerly included raise the price to $150 for Indoor and $200 for Outdoor. These prices move them into the range of what used to be much higher-priced metro-scale hardware. Meraki's system works by having little intelligence built into nodes instead relying on an Internet-hosted administrative system to handle the heavy lifting. Adding nodes requires just some configuration via a Web site. Each node auto-discovers existing networks allowing their addition. Each gateway to the Internet added to a Meraki network increases the bandwidth pool. The change puts tiers into effect. The Standard edition with the cheaper pricing doesn't allow billing nor user authentication, nor does it offer a custom splash page (a logo is all). Even the network name gets Meraki branding on it ("Free the Net" precedes a local name). Standard does offer a private WPA-protected network for the owners, but without any granular access control. This means that a group that wants to change small amounts for access or control access by user cannot use the entry-level version. According to the forums, this includes a lot of early networks. Standard networks also can't "whitelist" more than a handful of devices, which means that devices that lack the ability to display a Web page for authentication purposes can't even access the network. So no Xboxes, VoIP phones, and so on. So-called Legacy networks, ones that were built before this last week, can continue to run as they do or be upgraded to Pro status at no extra cost. But once upgraded, all the Pro limitations are in effect. Any new nodes added to a Legacy network must be Pro nodes, too; there's no option to add Standard nodes. This is part of what's causing ire on the Meraki forums. (One of these networks, Kokua Wireless, was praised in an editorial in today's Honolulu Star Tribune; someone from the network noted on Meraki's forums, "It'll be hard to build a business even @ the Pro level knowing Meraki can make such drastic changes." One network operator has already flashed his Merakis with alternate firmware.) Update: Meraki says it's been talking to all the operators and groups that have problems with their new model; I'll have more details Monday. In this formal release, Meraki now displays advertising on every page using what they variously call Community Messaging, Community Messaging & Advertising Platform, and Messaging Platform. It's often euphemistic. In effect, Google ads--Google is a Meraki investor--will appear on every page in a special toolbar that requires no installation. Which means that it's inserted using some technique--probably frames--that might cause other problems, too. Network operators can insert localized messages, but to a limited extent. There's no option for Standard and Pro users to disable advertising or the messaging bar. There's no disclosure on what revenue, if any, Meraki splits with the network operator. If Meraki handles billing for Pro users, they keep 20 percent of gross revenue. I had to check the Web site after being alerted to this change, assuming that senior management--largely a bunch of MIT grad students who turned RoofNet into this clever commercial offering--had been fired or shuffled, and a new carrier-oriented CEO was hired. As far as the site shows, it's the same gang. Which surprises me, given how open the group was about communicating, and how interested in community building. This is a huge stumble, when the community tells me that they were unaware of the changes to come until the Web site started to have new information on it. At $150 and $200 for managed nodes, Meraki has now lost some of its edge against companies like Tropos Networks, the most likely comparison. While Tropos, Cisco, BelAir, Motorola, Strix, and SkyPilot typically charge $2,000 to $5,000 for their nodes, with the more expensive ones including 5 GHz backhaul radios, those prices are heavily discounted, several sources have told me recently. Tropos nodes can cost EarthLink, its biggest customer, under $1,000, I have it from multiple parties outside the service provider. While $1,000 is clearly five times $200 for a similar outdoor piece of gear, that belies several factors. Tropos is using enormously high-powered radios, capable of producing up to the maximum legal signal strength in 2.4 GHz. Tropos has a sophisticated back-end that allows integration with many popular management and authentication systems. Using Tropos or other vendors' network gear is substantially less trivial than building one from Meraki pieces, but with enormously larger coverage areas relative to cost now, Meraki has moved itself towards that equipment range without bringing the robustness needed. The system and hardware has gotten rave reviews for the simplicity in building a network in bits and pieces. But the good will may have just flown out the window. I have just sent a query off to Meraki's PR firm, but it being Sunday morning, I don't expect to update this post until Monday. Muni-Fi's core failure is total citywide coverage: The requirement for winning bidders in municipal Wi-Fi projects to build out 90 to 97 percent of a city stemmed from a desire to combat previous institutionalized redlining and ghettoization and to overcome the so-called digital divide. City governments were often complicit in or proponents of restricting minority and poor residents to certain parts of town. Redlining was specifically tailored to prevent minorities from living in certain districts. Subsequently, any effort to restrict services has been dubbed redlining; Kozmo.com was the target of criticism in Washington, D.C., for creating service areas that handled only affluent residents, although the logic there is pretty clear. When muni-Fi was born in Philadelphia, the notion was that you couldn't create a network designed for the poorest residents and allow a service provider to cherry pick areas to serve. Nor could you require that the poorest and least-served areas of town receive service first, because they would undermine the potential for higher revenue. Thus the nearly-full-coverage requirement became de rigeur. But it's not financially sensible to sign a multi-year contract, sometimes 10 to 15 years long, with a service provider that locks them and the city into such a deal. Even contracts with milestones to delivery, or test areas that have to work first may be problematic. Does this mean that economic redlining or underserved area redlining is the only way muni-Fi can work? I think it's unclear. It's more likely that the richest residential areas of a city are the least likely to need Wi-Fi as an alternative. Maybe a proposal that charts out the worst 20-percent coverage area, the downtown district, and a handful of popular venues, and includes some indoor planning--indoor nodes in libraries or tied into libraries, recreational centers, and other places--would be a smarter first move. In that scenario, the poorest and most segregated residents would likely receive the most service first, which would better tie into grants and city subsidies to bring service in. Remember Willie Sutton's apocryphal quote about robbing banks: That's where all the money is. In this case, the underserved areas are where all the money isn't. Most of the 1,200 UK outlets of the fast-food giant will serve up free Wi-Fi by year's end: The Cloud will handle the build-out, apparently, although that detail is mentioned only in passing. Hotspot service costs around £5 ($10) per hour in England, so this might have an impact on pricing and users. Jiwire lists nearly 24,000 hotspots in the UK. In the US, about 9,000 of 12,000 McDonald's locations have Wi-Fi, operated by Wayport, which is a paid offering. While I sometimes read that McDonald's offers free access with a purchase, that doesn't appear as a policy, nor is it stated anywhere in information McDonald's makes available about its Wi-Fi. Free service is, however, provided to Nintendo DS users, an instant-messaging appliance's users (Zipit, starting in mid-Nov.), and subscribers to AT&T WiFi Basic. It's not a big network, but $500,000 was spent for few results: A firm said in Sept. 2004 that they'd blanket the area, but underestimated the equipment cost. They wound up predicting three times the number of nodes would be needed, and the city wasn't prepared to let them put them everywhere they needed to. About 200 sessions a day are counted in the limited area served. We've also released the 2004 edition of The Wireless Networking Starter Kit (2nd edition) at no cost as an electronic download. While the information is outdated in places--and the Take Control books refresh those details--we still think it's a good guide to the principles of Wi-Fi, how to set up a network, and how to use hotspot networks safely. MetroFi's largest network buildout may or may not go forward: Mike Rogoway of The (Portland) Oregonian newspaper reports on his blog this morning that the mayor's office told him that MetroFi will stop building out the Portland network. Later in the day, after contacting MetroFi, I heard from a company spokesperson that the firm has not made any plans to halt the build out. The spokesperson said the company hasn't said in writing or otherwise that plans have changed; they're working with the mayor's office to resolve this confusion. Rogoway's report was updated, too. This led me to Logan Kleier, the project manager for the city's Wi-Fi project. In an interview, Kleier explained that MetroFi has been seeking to get an anchor commitment from Portland in which the city would commit to spending dollars on a routine basis. However, "Their plan to complete the network is dependent on either the city's ability to become an anchor tenant or the completion of new venture capital rounds." This doesn't conflict with MetroFi's statement to me or a later statement to Rogoway at the Oregonian. MetroFi intends to keep building the network; Portland intends to not become an anchor tenant. Kleier said, "We've been fairly clear from the RFP construction and the contract signature and all the way through today is that our relationship is a no-risk relationship, and does not involve anchor tenancy, and we continue to be clear about that." He said the city doesn't have a commitment to spend "even $5" under the terms of the deal. Kleier did note that the city continues to consider the usage numbers on the network as a positive development. "There is pent-up demand out there for it. You're just faced with a changing climate in how to pay for it," he said. The high use of the network "sometimes gets lost in the pessimism." Portland's network has received an ongoing stream of criticism from local community wireless activists, reporters, and others, while receiving praise when and where it works. MetroFi has released ongoing statistics from the use of their ad-supported network which indicate it likely has more sessions and usage than any other Wi-Fi network in the world. Among other concerns was the lack of early discussion about the necessity for an indoor bridge. Portland's RFP and contract said it would be nice to have a network in which that kind of hardware wasn't generally needed, but didn't absolutely require access with normal Wi-Fi adapters in homes and businesses. MetroFi has continued to state their commitment to building out Portland even as they shifted their business model for new deployments to require upfront contractual commitments to purchase services on the network they build. In my Economist piece of last month, I noted that Portland and Minneapolis were the only two big cities to have agreed to pay money upfront. Portland's agreement was pretty vague, though: they set a schedule of charges and likely services they might buy, and that, so far, hasn't translated into more than a few hundred dollars a year of commitments. Minneapolis, by contrast, has committed millions in service fees. Some criticized my inclusion of Portland in that duo because of the lack of strict commitment. However, I'd argue that in contrast to the vast majority of big-city RFPs and contracts, Portland's specifically was inclusive of buying service; others specifically exclude that. San Francisco's contract with EarthLink, never signed, said in great detail that by building this network, EarthLink would have no privileged position in bidding for city contracts for telecom. Which seemed misguided at the time, and still does. Portland was clearly not an anchor tenant deal, however, and that's become the sticking point here. Kleier said that he fields calls from other cities about the Portland project all the time, and talks to colleagues at conferences on the subject. When he brings up challenges, they're not always receptive. "If they're not in this place of deployment, they're not ready to hear it," he said. BT and Fon have finally revealed a deal first disclosed by GigaOm, others in February and March 2007: Articles by Reuters and Om Malik discussed the deal in progress, along with an investment by BT in Fon. The announced deal matches what was discussed back then: 3m BT customers will be able to turn Fon service on, and BT has put in some of their pounds. Fon has been building a grassroots-style worldwide hotspot network by allowing individuals to share their broadband service to other Foneros for free and to all-comers for daily fees of about US$2/€2. Fon quietly updated their pricing model recently, according to a spokesperson I contacted via email, which made this announcement initially confusing to me. In the past, Fon charged hotspot users based on whether they were Foneros (Linuses shared for free with other Linuses, Bills charged) or not (Aliens). The new model allows all Foneros to roam onto all Foneros, but Aliens continue to pay on any Fonero location. Linuses are simply forgoing a share of the revenue, which is a big shift from the previous generosity-begets-generosity approach. And Bills lose the revenue split from other Foneros, but I expect that that amount must have been low for this switch to take place. BT Foneros can choose to be Bills or Linuses. Fon and BT's job now is to market the idea of turning this service on to BT's customers. BT could use it as a customer retention tool or a way to get switchers to move to their service. In related news, BT will allow its Total Broadband retail customers--those subscribing not just to a BT DSL line but to BT service over that line--to access 7,000 Wi-Fi hotspots and 12 city hotzones in the UK at no additional cost. That seems to me a more obvious move and a bigger win than the Fon deal initially. Do the Time-Warner (announced April 2007) and BT deals actually mean anything in terms of building Fon's network? Sure. But as I've noted repeatedly, Fon's network is only as valuable as the best locations in it. If most Foneros are in homes in residential neighborhoods and perhaps urban highrises, those locations aren't accessible or useful to most people. With a daily charge intended to prevent Fon from becoming a broadband replacement--unlike most hotspot networks, which have monthly plans designed to turn them into broadband replacements--there are a restricted number of uses for Fon in locations where you can't, you know, sit down or make a comfortable phone call. Zunes will come in 4, 8, and 80 GB versions: Lots of changes, but the only real news is syncing of media over Wi-Fi. Podcasts can be synced, but not downloaded wirelessly. No wireless music store. New models ship in mid-November; existing 30 GB units will get software updates. They'll selling some DRM-free music (1m tracks). Pretty much walking in Apple's footsteps, not filling them. The Starbucks/Apple deal that allows free use of the iTunes Wi-Fi Music Store in retail establishments launched today: I wrote up my experiences for Macworld.com, notably that the launch in at least two stores were glitchy, and even after the main features worked, I still disagree with their fundamental setup. Apple advertised this experience on their site thusly: "Stroll into a participating Starbucks and you’re connected automatically. Browse and search the entire iTunes Store from your laptop or millions of songs on the iTunes Wi-Fi Music Store from iPod touch or iPhone." Not quite. In the two stores I checked today with an iPod touch, iPhone, and Mac laptop, I had to select the network "tmobile" when offered to me; there was no automatic process. Further, I was never able to get the laptop to access iTunes--or even T-Mobile's gateway page. (I could reach T-Mobile.com, and could use other nearby Wi-Fi networks, so I'm mystified at that problem.) The iPod touch and iPhone could, ultimately, reach the iTunes Wi-Fi Music Store, allowing me to browse selections, see what was playing, and purchase songs. Once having selected "tmobile," the iPod touch and iPhone remember the network as a choice, meaning that they try to use the network for Internet operations other than iTunes Wi-Fi Music Store interaction. Since T-Mobile's network is for-fee, without an account or paying for service, you have to "forget" the network after each time you use it in order to access the Internet unless you want to pay T-Mobile or have an account with them (see the article for instructions). What I'd expected is that T-Mobile would have enabled a special virtual SSID, or secondary network name, that the iPhone, iPod touch, and some part of iTunes would be able to recognize and connect to without affecting choices made for general Internet connectivity. They did not. This is a huge mistake. It will result in frustration for users who otherwise expect to choose selectively about which networks they use for Internet access. For iPhone users, you can optionally turn off Wi-Fi to force a switch to the EDGE network to avoid using T-Mobile's service outside of iTunes, but that's an extra step. This should have been seamless. A beat was skipped. Apple and Starbucks won't have the success with this they expect because they will train regular visitors to not accept the "tmobile" network. ZDNet reports that the Australian government research body CSIRO will continue to press its Wi-Fi patent claims: CSIRO has a patent on certain aspect of networking that relate to OFDM, and have won a few court victories against Buffalo. They are being sued and suing a variety of firms over patent licensing fees. The IEEE wanted an assurance about CSIRO's intent as part of the process in moving forward with 802.11n. The IEEE doesn't like to move forward on patents in which there's intellectual property in dispute, depending on what the risk is in approving a standard that wouldn't be able to be built. In this case, CSIRO has offered terms--you take your pick at whether tens of cents to dollars per device is reasonable or not; I don't have the context. But the lawsuits overshadow their terms. I've read their patents and other documents, and it's now in the realm of specialists, as their description might cover aspects of OFDM--part of 802.11a, g, and n, as well as mobile WiMax or 802.16e-2005--but within the niceties of patent law, only litigation will tell. This articles provides a timeline of events. However, the first entry that "CSIRO lodges US patent for the invention of a wireless LAN" is vastly overstated. Their patent covers multipath issues in wireless networks, an important subset, but still a subset, of wireless LAN protocols. Mike Rogoway has been bulldogging the MetroFi network in Portland, Ore., for the city's newspaper: Rogoway isn't giving MetroFi a hard time, but he's keeping constant scrutiny on developments and performance. He tested out the Ruckus MetroFlex, a Wi-Fi bridge designed for this kind of market, that can connect to a larger network and rebroadcast at lower power as a virtual local network. It's a neat idea, and the price is just $99. Rogoway found that in areas he's had trouble obtaining reception from the current MetroFi footprint that Ruckus can make a big difference, but not only. Ruckus's PR guy David Callisch, always amusing and frank (a hallmark of Ruckus), tells Rogoway that using Wi-Fi in this manner is "having a conversation across a soccer field." Callisch is quoted saying, "If it's very quiet, I'll be able to hear you on the other side of the soccer field. If there's noise, I can't. It's the same with Wi-Fi." I've often compared how so-called interference affects Wi-Fi to a number of conversations happening among different groups of people in a room that echoes. Some people speak softly or unclearly, others are yelling and crisp. The speaker is rarely as big a problem as the listener: if there are a lot of loud conversations going on, it's always hard to distinguish one from another.